The Municipality of Talibon has a very rich historical heritage. 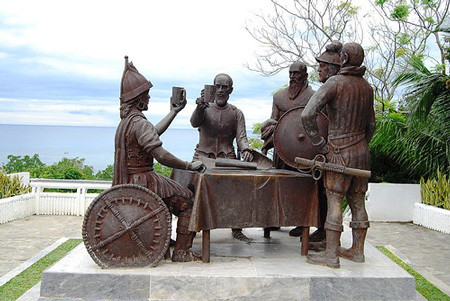 Christianization of the town started long before Miguel Lopez de Legazpi ever set foot in the island of Bohol in 1565. Taken from the archival researches of Rev. F. Jose Maria S. Luengo, PhD., priest and historian and founder of the Mater Dei College of Tubigon, Bohol, Talibon traces its history back to the time of Magellan after his death on April 27, 1521. By an unexpected turn of events later, the survivors of the massacre that killed Magellan in Cebu sought refuge in Bohol, particularly in the area around Talibon. They became the first lay missionaries to the island of Bohol. When Miguel Lopez de Legaspi reached the island in 1565, he remained on the island with the natives for some time. In the barrio of Bo-ol, now Tagbilaran, he entered into a dramatic blood compact with the local chieftain, Sikatuna. That event sealed the sovereignty of Spain over the island, which was later administered through Cebu. The first batch of missionaries to arrive were the Augustinian Recollects who came in 1565. When the Jesuits arrived in 1596 and reached the area of Talibon, they were surprised to discover that a Christian community already existed in the area, owing to the Spanish-Talibongnon intermarriages dating back to the 1520's. After the Jesuits came, the faith spread fast revolts in the country against Spain. Tamblot revolted in 1622. Although his success lasted only for six months, his revolt is recorded as the first unbeaten revolt in Philippine history. In 1744 Dagohoy revolted and gained independence for the island of Bohol for eighty years. On November 8, 1941, the Diocese of Tagbilaran was established and was given jurisdiction over the entire province of Bohol, separating it from Cebu, its mother diocese. And on January 9, 1986, the new Diocese of Talibon was created, separating half of Bohol from the Diocese of Tagbilaran. The early Christianization of Talibon accounts for the deep religiosity of the people in the area, specially the lay people whose loyalty to Christ and His church is beyond question. During World War II, a guerilla force was organized and took control and authority over the town of Talibon. Then Senator Carlos P. Garcia, acted as High Adviser to the group and during the Japanese occupation, narrowly escaped capture by fleeing with his family to Leyte. In rage, the Japanese soldiers burned down the Garcia house on July 4, 1942. 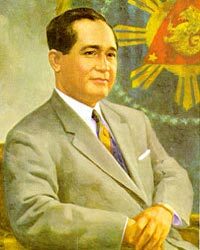 In 1957, when Carlos P. Garcia became the 4th President of the Philippines, the church was renovated. In 1986, the Diocese of Talibon was created and Most Rev. Christian Vicente Fernandez Noel, D.D., was appointed as its first bishop in September 1986 and whose office he holds up to the present. 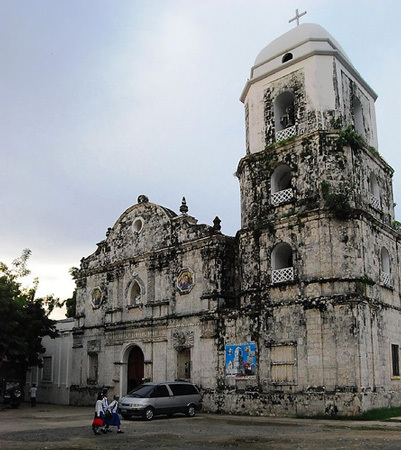 Therefore, the church of Talibon by chronology, organization and operation became the cradle of Christianity in Bohol. Today there are 25 parishes in the diocese, ministered to by 50 priests. There are also 35 religious sisters active in the running of 16 secondary Catholic schools. The vocations to the priesthood are thriving, and trust in Divine Providence is the main recourse of the poor inhabitants, mostly farmers and fishermen. Research conducted on the creation of Talibon yielded a number of primary and secondary documents but not one of them could accurately ascertain the exact date of the creation of Talibon as a town. Documents from Patronamos, 1785-1789 kept in the Nationa Archives, Manila, twice cited Talibon as Pueblo but it appeared that in those years, it shared the same town officials and parish priest with Inabanga, being still part of its ecclesiastical mission. The term Pueblo might have been loosely used because the following secondary sources gave conflicting accounts: Lee W. Vance, in his Tracing Your Philippine Ancestors, printed in 1980, cited Talibon as a Spanish pueblo organized in 1806. Rene B. Javellana, in his Wood and Stone for God’s Greater Glory cited Talibon as a pueblo in 1830. Most recently, Simplicio M. Apalisok, in his Bohol Without Tears cited April 22, 1854 as the actual date of the creation of Talibon. He alleged that his reference was the Ereccion de Pueblo from the National Archives. But recent research conducted by no less than the Chairman of the National Historical Commission Institute, Mr. Ambeth B. Ocampo, failed to yield this data. Instead, he confirmed that the Errecion de Pueblo document definitely showed that Talibon was already a Pueblo Nuevo (New Town) in 1837, thus contradicting Apalisok. Recollect historian Agustin de la Cavada, in his Historia Geografica Geologica y Estadista de Filipinas, published in 1876, cited 1722 as the year Talibon was founded as a Visita (Mission) and it became an independent parish only in 1724 under the advocation of the Blessed Trinity. However, according to another historian, Rene H. Javellana, 1722 was the year Talibon became an Independent parish separate from Inabanga, not as a town. Manuel Buzeta, bolstering 1837 as the year of the creation of Talibon, wrote in 1851 in his Historico de las Island de Filipinas: “Talibong – pueblo can cura y governadorcillo en la isla de Bohol. . .” But some documents in San Agustin Museum in Instramuros, Manila suggested that it remained attached to Inabanga until 1831. Another document retrieved from Patronamos, 1828-1837 cited Talibon as “de Nuevo Erreccion del Pueblo de Talibong de la Provincia de Zebu (The Foundation of the Town of Talibong of the Province of Cebu) which clearly showed that as of 1829, the date of that document, Talibon was already a town. In a Political History published by the Rizal Cultural Committee of the Province of Rizal, the creation of towns was explained this way: “Towns have their own individual histories. Many were thriving villages long before the Spaniards came and all the Spaniards had to do to make them official towns was to give them churches and to recognize their ancient names and boundaries. Other originated as missions or “visitas” while others as encomiendas. Still others were overgrown barrios that separated themselves from their matrix or parent-towns”. Since creation of towns was closely associated with the building of churches, it is noteworthy therefore to consider the documents from the San Agustin Museum in Intramuros, Manila provided by its Augustinian Director, Fr. Galende, to Vice Mayor Restituto B. Auxtero, now the Municipal Mayor of Talibon, thru the Spanish Ambassador to the Philippines, Hon. Luis Arias that related the following: Bohol’s first 7 parishes as established by the Jesuits were Baclayon, 1595; Loboc, 1602; Jagna, 1631; Dauis, 1697; Talibon, 1724; Tagbilaran, 1767 and Maribojoc, 1768, but dates of creation of this towns did not appear in the padron (Bojol, Erreccion del pueblos) kept in the Records Management and Archives Office in Manila. Chairman Ambeth Ocampo of the National Historical Commission Institute, after his research in February, 2007, on the date of the creation of Talibon appeared to be right in his opinion that the creation of Talibon might have occurred within 10 years before 1829 or a little earlier. He opined that only the Royal Decree creating the municipality of Talibon can finally settle the puzzle but even Spanish Ambassador Arias, after being requested by then Vice Mayor Restituto B. Auxtero to furnish such document, showed signs of impossibility to retrieve such ancient document from the Spanish Archives.